My grandparents moved to Brighton in the early 1900s and settled in the Church Street area. My late dad went to school there (I’ve got his reports from 1918-1924) and he was friends with ‘Issy’ Rosen who ran the famous second-hand clothing shop close to Queen Street. I know the area has been much changed and modernised, but I’ve come across one or two interesting photos from the 1920s. 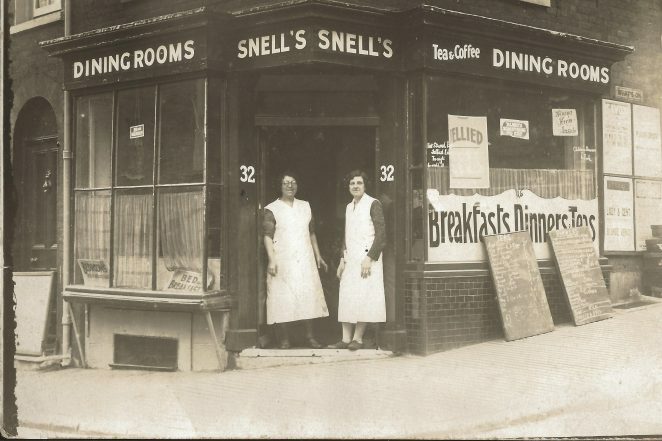 This one is of my grandma’s cafe (she’s the one with glasses) – Snell’s cafe – which was at 32 Church Street next to Tichborne Street. I also have a paper bag with the name on it. The blackboard with prices is interesting too, as is the ‘What’s On’ poster on the wall. I hope this is of interest to some ‘old’ Brightonians. Click on the photographs to open a large version in a new window, then click again to enlarge further. Hi Mike, what a fascinating picture, with some wonderful period detail in it. However, some of the details you give are incorrect. From the adverts for the Savoy on the wall, all of the films featured were released during 1932. The upper advert for “No man of her own” starring Carole Lombard and Clarke Gable was released December 15th 1932 in America, so the probable date of the photo is very early 1933. The Dining Rooms were located on the corner of Windsor Street, not Tichborne Street – the building still stands and is now a camera shop. Regards, Andy. Mant thanks for the corrections Andy. 1933 sounds right and I wasn’t sure about the exact date. I got the Tichborne St reference from the old paper bag I have (which I will upload to the site). I think my grandma must have had another fish shop in Tichborne St! I think there was also a cycle shop in Church St – was it Marsh’s? Regards Mike. Hi again Mike, there was a ‘Miss Snell’ living at 22/23, Tichborne Street in 1933, which had been previously listed as Dining Rooms run by Mrs. M.C. Snell in the late 1920’s. You are quite right that Marsh Brothers, Cycle dealers, were listed at 79/80, Church Street, with other premises in Cowper Road. Regards, Andy. I thought I might make another observation about the photo, that would probably be missed by most observers. If you look at the pavement, it was still the original brick paving that Brighton was renowned for during its earlier history. During the 19th century this had become the bane of ladies wearing long dresses, as when it had rained heavily water pooled in cavities under the bricks. Treading on one of these bricks would send a spurt of ruddy coloured water into the air catching the unwary victim. During the summer they were dry and dusty. Surviving examples of this paving are now rare, most of it having been replaced before the 20th century. Regards, Andy. Andy I had not missed the paving, but I thought it looked like “lined concrete” with the grooves (not Groves) just in one direction. Certinally coming down the hill that’s what it looks like, although to the far right it could be brick! The other thing I noticed is that if you look at it on Street View Google Maps, the building has changed very little today, although the basement opening has gone! Thanks for confirming Marsh brothers Andy. 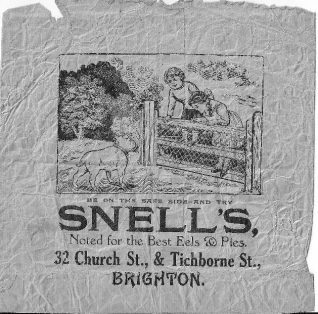 The Miss Snell would be my Aunt Rosie and I knew she had a fling with one of the Marsh boys! I’ve got a photo somewhere of the cycle shop but can’t lay my hands on it – I’ll rummage a bit more! Can anyone give me the name of the local school in that area – it may have been in Bus St or Jubilee Street? The Head Master was Harry H. Gilder in 1918 and G. Mellett in 1924. During the war my father Fred Smith owned an antique shop in Church street It was called the Old Inglenook. Next door going up the street was, Rolfes the fishmongers, then Waters the newsagents, and then Marshes the cycle shop on the corner of King street. Just around the corner in King street was Thompsons baker. You could get a hot doughnut there for a penny. I used to deliver newspapers all around the streets in that area. There used to be some flats called Jew street buildings behind the chemists shop in Church street. There was also a block of flats at the end of Windsor road, behind the Regent cinema. They had open iron balconies that were covered in ice in the winter. Are they still there I wonder? Does anyone remember the foundry that was in Portland Street? I’ve heard of Cowper Street (in Hove) Andy, but not Cowper Road in Brighton or Hove (your posting dated 5/1/12). Where would this have been? Regards Alan. I remember Blabers Portland Foundry very well – used to be next door to Clifford of Broghton, Motor Factors – lovely people still going strong in Hove. I remember the Portland foundry. One of the sons of the owner, along with one of their workers, went on to set up scooter shops in the 1960s. Their names were Derek Blaber and Tony Bugden and are well known in Vespa and Lambretta circles. Quite any era. Do you remember the 1950s fish and chip shop?